Crumpled in front of me in the snow lay my 7-year-old sister, a pile of pink & purple snowsuit. My father leaned over her, trying to soothe her anguish and suffering. She refused to budge. It was the third time she had fallen into cold, wet snow, and she was making sure it would be the last. My mother’s voice, from somewhere ahead, urged me to join her and leave my father and sister. So goes my earliest memory of cross-country skiing. Being a particularly empathetic person even as a child, the vivid frustration of that moment—though not my own—has stayed with me, so that now each time I push gracefully across the snow, as I do often in these winter months, I come into the glide with a sense of achievement and wonder. Skiing doesn’t take me far from home these days. The snow, thick and deep in the valley, has turned the city into prime cross-country real estate. It’s a simple secret: Snow in the valley equals great tracks at the golf course. 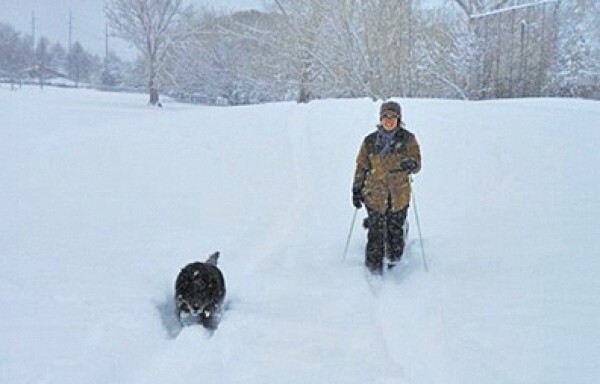 Generally, Salt Lake City is not a great place for classic cross-country skiing. Places with official tracks like Millcreek and Brighton Ski Resort are just too steep. Cross-country skiing is meant for long, flat spaces with gradual ups and downs or, at the very minimum, enough space to switchback up a steep section. The best terrain, therefore, is in the valley. The Jordan River Parkway would make an awesome winter ski track if the city groomed it instead of plowing it. Golf-course skiing is the best option available. Though it’s not officially sanctioned by golf-course proprietors, there is no city ordinance that forbids it. On a sunny day just after a recent storm, I found myself on the Forest Dale Golf Course. Cottonwood trees dotted the field of snow. A flock of Canada geese flew skyward, honking, disturbed by my summit of a small hill near where the flock had stood, preening. Bending my knees and leaning into my toes, my ski tips carved a straight line down the other side of the hill. At the bottom, I kick-glided between bent, broken cattails lining a pond on one side and a green metal trashcan on the other. The geese came to rest again on the far edge of the field. I climbed and descended another in a small series of hills. As I turned north, the sound of traffic from Interstate 80 filled my ears. Golf-course skiing is an urban experience, though of varying degrees. At Forest Dale, it is difficult to shut out the sound of interstate traffic. But at a larger course, like Bonneville, one can get lost among thickets and in dales and forget about the city. The best outings here are at night, during a snowstorm, or the day after when others have left their tracks. Cross-country skiing is not about first tracks. Breaking trail means slowly plodding along like a snowshoer with 6-foot-long sticks tied to your feet. Second tracks, or third or fourth, mean smooth track and better glide. Some might argue that these courses are for putters, not skis. But what’s the harm when there is too much snow to place a tee? Winter is the only time some (myself included) feel at home on the fairway. Still, when I pulled up to the Rose Park Golf Course recently to find my way blocked by 10 vertical feet of chain-link fence and a tightly padlocked gate, I realized that I shouldn’t take my free access on courses for granted. Behind the gate and past a sign reading “closed till snowmelt,” I gazed longingly for a moment at the undulating hills of unbroken white.